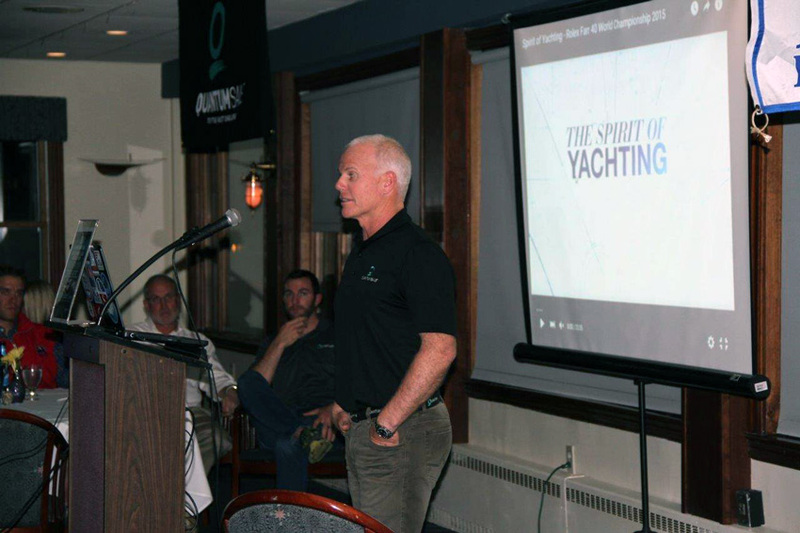 On Wednesday, March 9, Terry Hutchinson visited the Buffalo Yacht Club to share stories from his experiences as a professional sailor. Speaking to a full house, he kept everyone engaged and answered lots of questions. Terry touched on many topics, including his role as the tactician on the Quantum TP52 team and the Mini Maxi 72 Bella Mente. With the America’s Cup coming up, he also talked about that event and his experiences with Artemis and previous campaigns. Buffalo Yacht Club - Quantum's Terry Hutchinson speaks to a full house. Terry’s main focus, however, was his Farr 40 World Championships, showing videos and sharing notes from those events. He covered everything from the world championship when they lost the regatta by a single point to the following year, when they reclaimed the title. It’s not enough to know your boat and your crew. Practice together often on the same boat you’ll race. Time spent sailing and practicing with the same team has a measurable, positive effect on results. Don’t just cruise with your crew. Be intense and push yourselves in practice to create difficult racing scenarios. For example, make your practice track shorter and more intense than the race track, so maneuvers on a full-sized course will seem easier. Don’t trust yourself to remember, and don’t put that responsibility on your crew. Take solid notes and get the entire team to comment on what worked and what didn’t. The old adage “you can’t win the regatta on the first day, but you can lose it” is one I’ve always liked, and it’s one Terry supported. Set goals for average scores that will give you a chance to win on the final day. Don’t just look at their average scores. Do some research and find out what you can expect from each boat at the start line and on the course. Forget about the weather and other boats. Instead, figure out how you plan to respond to each possible situation. Terry and his teams set their schedules nearly a year in advance, including crew, flights, hotels, food, gear, etc. Plan ahead so you can focus on racing, not the logistics. Not everyone can afford a full time coach/photographer, but having someone from another boat come out to evaluate what you’re doing can be a tremendous help! As for photos, taking a few pictures of your own sails and set up is free and easy. You can usually find photos of races online after the regattas. Use your coach’s comments and the pictures to study and improve your own technique. Focus on your job and don’t worry about what your teammates are doing. If everyone follows your lead, no one will be worrying – you’ll all be too busy doing your own job the best you possibly can. If we forget to do this, our sport won’t grow and future sailors won’t stay with the sport. Whether you’re racing in the America’s Cup or sailing with your kids, don’t forget that critical ingredient – fun!